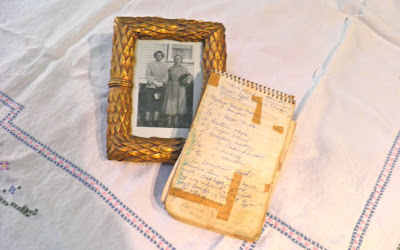 Aunt Nettie and Aunt Hilda, about 1963, with their recipe book. Seems like these days everything is going to hell in a hand basket, so I'm feeling a bit nostalgic for simpler times. Some of my happiest memories, like probably most of you, are when I was young, before all of the pressures and duties of adulthood began. Intertwined for me are two things, or should I say three—my two Great Aunts and my days spent with them. It was like every day was filled with nothing but sunshine and warmth. My mother's aunts never married. One was devoutly religious, the other fell in love with a man she was not allowed to marry. When they retired from their careers in the States they returned to the village where they were born and built a small house. It was right across from my parents home. Since both my mother and father worked, it fell to Aunt Hilda and Aunt Nettie to provide "daycare." They were both in their 70s at the time I was a toddler. I remember trips to town and to friends, games of hide and seek, crafts and baking. It seems they were always doing something. These two wonderful people held a very special spot in the heart of the village, where everyone called them Aunt, regardless of relation or not. 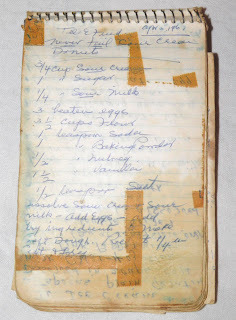 After they passed away I found their hand written recipe book. It was filled with their favourites. Cakes, breads, sauces… but most importantly, their donuts. Aunt Hilda and Aunt Nettie were famous for their donuts. Some recipes are special. They remind you of a specific get together, or holiday or special event. But sometimes recipes come to define people. 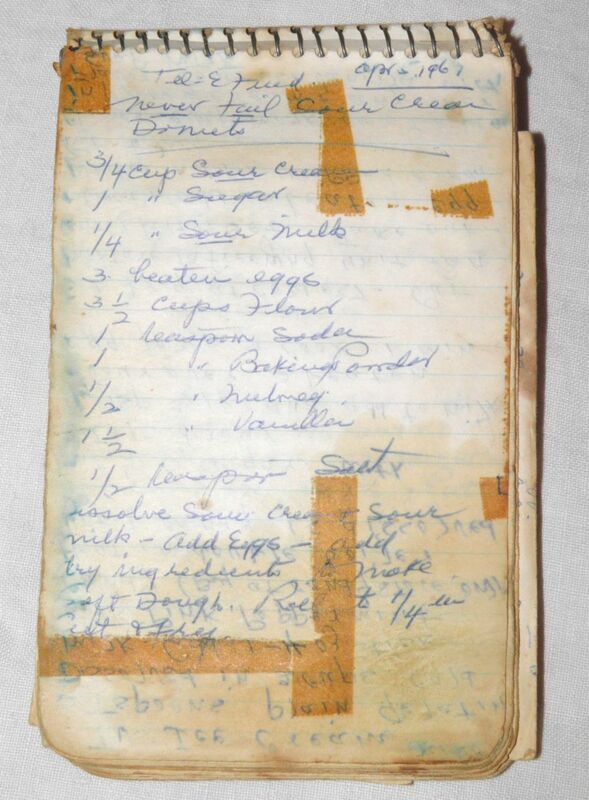 This recipe defined my two Great Aunts for the whole village where they lived. They always had to make a double or triple batch, because they were eaten so quickly, and they were more than generous with them to family and friends. 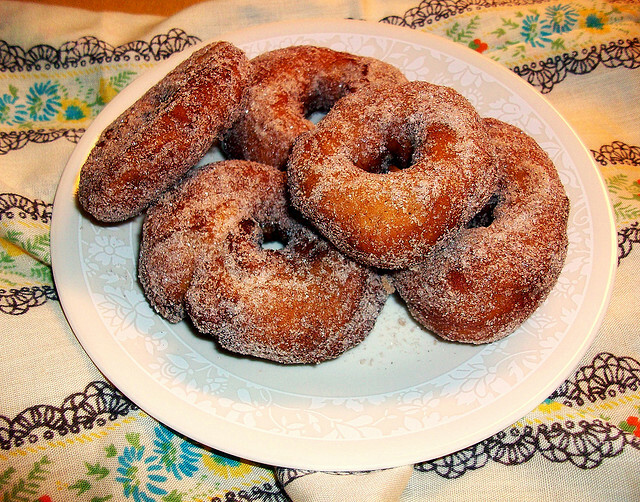 I remember fresh donuts being delivered around the village, still warm in bags packed with sugar, and love. I don't think I've had these donuts since the early 1980s. Aunt Hilda would have been in her nineties then, but still made them, if infrequently. It was probably a bittersweet activity for her after Aunt Nettie passed away, as the two always made them together, Aunt Hilda frying, and Aunt Nettie sugaring. I hope that you try these, and they give your families the happiest of memories as they did for ours. * to sour milk add 1/4 tsp of vinegar to the 1/4 cup milk and let sit for 15 minutes. Stir the sour cream, sugar and soured milk together until the sugar is dissolved. Add in the eggs. Add the dry ingredients and mix to make a soft dough. Roll out the dough to 1/4" thickness. Cut with a donut cutter. Slide the donuts into hot oil to fry. If you read my blog, you know how I feel about pots of fat on the stove... please be careful. Use a thermometer to check the temperature of your oil. It has to be 370° - 375°F, no more, no less. Turn after browned on one side and allow to brown on the other. Wooden chopstick works well for this. 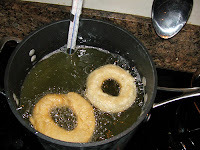 Remove the donuts to paper towel to absorb any excess oil. While still slightly warm, toss the donuts with some sugar in a bag. You can add cinnamon if you like. Let cool, and share with friends. Recipes: Old Fashioned Pudding Cakes! Booze of the Week: Pucker up, it’s Lime Liqueur!